In 2010, the systems biology standards community inaugurated a new, broader series of meetings to replace, among other events, the individual SBML and SBGN workshops and BioPAX meetings. The new meetings, COMBINE (Computational Modeling in Biology Network) and HARMONY are a recognition of the fact that there are multiple allied standardization efforts that should work more closely together to ensure smooth interoperability. The two meetings address different needs and community emphases. COMBINE is a workshop-style event with oral presentation, posters and breakout sessions. The first annual COMBINE meeting took place in Edinburgh from Oct 6th to 9th, 2010. HARMONY was a hackathon-type meeting, with a focus on development of the standards, interoperability and infrastructure. Unlike what happens at COMBINE meetings, there were not general discussions or oral presentations during HARMONY; instead, the time was devoted to allowing hands-on hacking and interaction between people focused on practical development of software and standards. The 2011 HARMONY meeting was hosted by the Computational Biology group at the Memorial Sloan-Kettering Cancer Center. 17:00 Group dinner @ Fatty Fish, a fusion Japanese restaurant located a few blocks from MSKCC. The meeting was held in the Rockefeller Research Laboratories of the Memorial Sloan-Kettering Cancer Center. 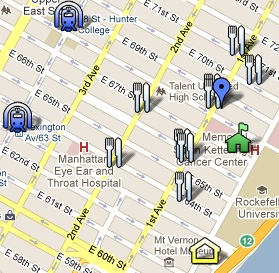 MSKCC is located in the Upper East Side of Manhattan and is within walking distance of major subway lines. We put together a comprehensive Google map, showing the meeting location, the hotel, various restaurants and subway entrances.